This twist on the popular ad series features the silhouette of a birder looking through a spotting scope, along with the text iBird. 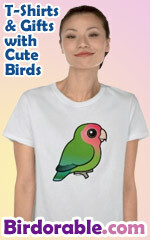 A great gift idea for birdwatchers of all ages! Birding is fun!